I'm currently using the absolutely ancient "Fusion" emulator to emulate a 68k Macintosh (specifically, a Quadra 700), but it only runs under MS-DOS, so I'm using a VirtualBox VM to emulate that. I'd like to eliminate one layer of emulation. It doesn't matter if it requires a ROM image or has a re-written ROM: I've got dumps from the aforementioned Quadra and a Performa 630 that I can use if needed. Invalid ROM file size. 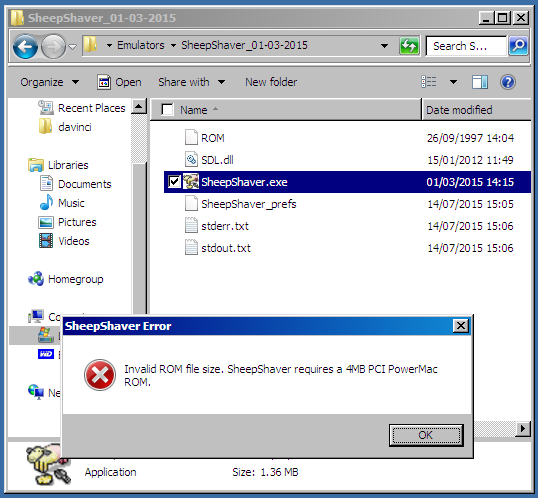 SheepShaver requires a 4MB PCI PowerMac ROM. as shown in one of the dialogs in the screenshots below. 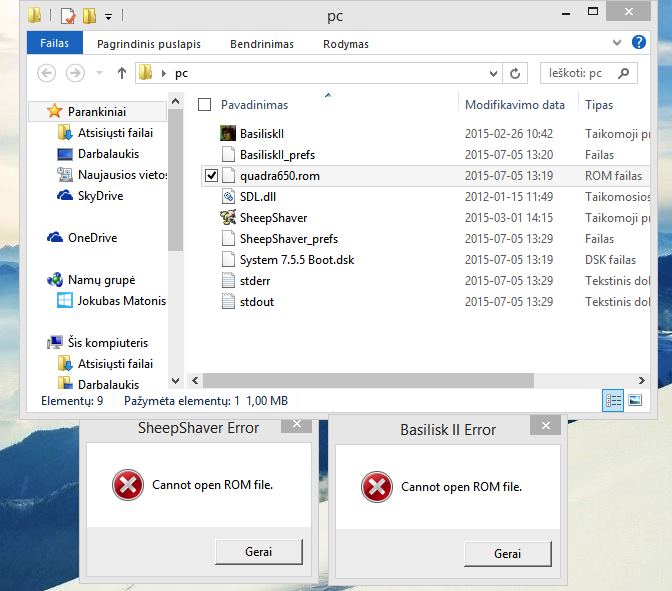 SheepShaver and BasiliskII both work on Linux and should support your requirements. Runs MacOS 7.5.2 thru 9.0.4. MacOS X as a guest is not supported. I actually answered a Quadra 650 emulation related question, a while back, although it was for Windows, on SuperUser. I have just spent the last hour trying to find/recover it, after the OP, who asked the question, has subsequently deleted the question. I have reproduced the question and answer below - hopefully it could be useful, in case any stumbling blocks are encountered. I was thinking I could run Mac OS 7.5.5 on vMac with color but no it won't work with color only OS can run. I thought it would work if I use BasiliskII but when I assemble the ROM, SDL.dll and the other stuff, I got an error about the ROM: "Cannot open ROM file." The same thing happened with SheepShaver. This is very huge problem and I don't know how I can fix it. On forums it said quadra650.rom will work but I tried and nothing special, I got the same error. I opened both BasiliskII and SheepShaver and I took a screenshot for you guys to know tell me what's going on? I got the disk image from youtube - Tour of Mac OS 7.5.5 with color + games (with download links). Read the description for .dsk file. I've managed to reproduce your error, using a Quadra 650 ROM file from a tutorial on RedundantRobot. The issue is that you need to specify to the emulator where the ROM file is located. Just dropping it in the same directory is not sufficient. 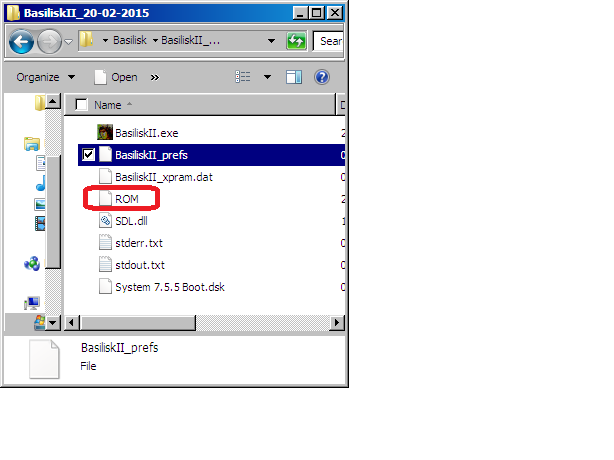 This item specifies the file name of the Mac ROM file to be used by Basilisk II. 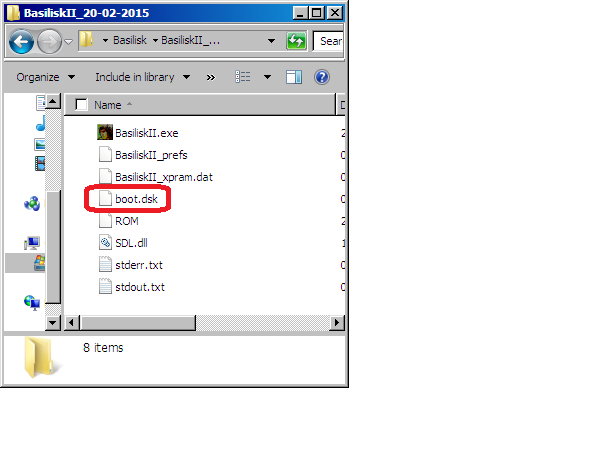 If no "rom" line is given, the ROM file has to be named "ROM" and put in the same directory as the Basilisk II executable. So the easiest option, without requiring you to modify the preferences file, in the Basilisk II directory, rename the ROM file, from quadra650.rom to just ROM. If your disk is specified corectly then the virtual mac should now boot. This item describes one MacOS volume to be mounted by Basilisk II. There can be multiple "disk" lines in the preferences file. Basilisk II can handle hardfiles (byte-per-byte images of HFS volumes in a file on the host system), HFS partitions on hard disks etc., and MacOS-partitioned disks (it can only access the first partition, though). The "volume description" is either the pathname of a hardfile or a platform-dependant description of an HFS partition or drive. If the volume description is prefixed by an asterisk ("*"), the volume is write protected for MacOS. Basilisk II can also handle some types of Mac "disk image" files directly, as long as they are uncompressed and unencoded. BeOS: To specify an HFS partition, simply specify its path (e.g. "/dev/disk/scsi/0/1/0/0_3"). If you don't specify any volumes, Basilisk II will search for and use all available HFS partitions. Unix: To specify an HFS partition, simply specify its path (e.g. "/dev/sda5"). If you want to access a MacOS-partitioned hard disk or removable volume (Jaz, Zip etc.) and your operating system doesn't understand MacOS partition tables, you can specify the block device name (e.g. "/dev/sda") to access the first HFS partition on the device. Under Linux, if you don't specify any volumes, Basilisk II will search /etc/fstab for unmounted HFS partitions and use these. 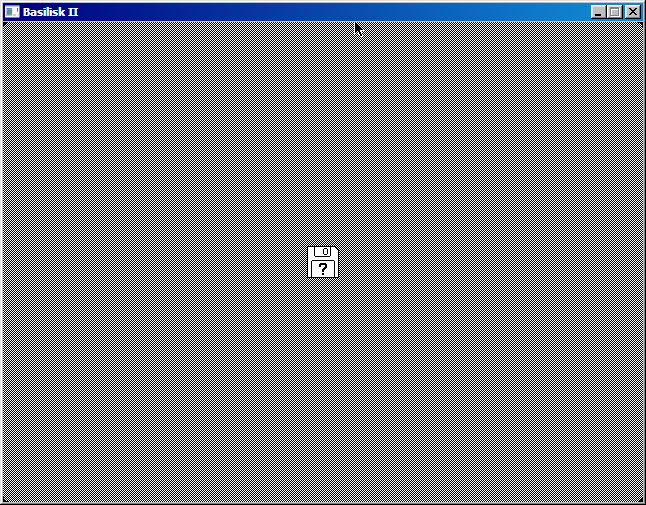 AmigaOS: Partitions/drives are specified in the following format: /dev/<device name>/<unit>/<open flags>/<start block>/<size>/<block size> "start block" and "size" are given in blocks, "block size" is given in bytes. Windows: To define a logical volume (Windows NT only), specify its path (e.g. "c:\"). To define a physical volume (NT and 9x), additionally give the "physical" keyword (E.g. "physical c:\"). For safety reasons, volumes are mounted as read-only. This is due to the bugs in PC Exchange. If you don't specify any volume, the files *.hfv and *.dsk are searched from the current directory. Note that in this case, Basilisk II tries to boot from the first volume file found, which is random and may not be what you want. 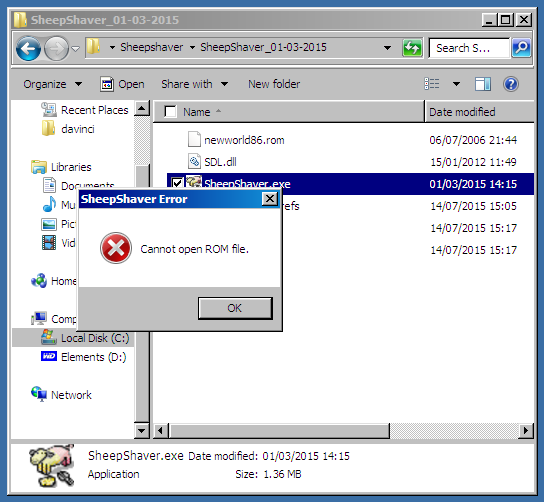 If you rename the file to just ROM, again without any file extension, then SheepShaver will run, as desired. I believe it also supports pass-through CD-ROM access, and possibly ISO-image-based CD-ROM emulation. There are some other emulators that might work better than Basilisk II depending on what exactly you need. Cockatrice is a fork of Basilisk II. It has better networking, sound, and support for SCSI disks, but is missing some other features (don't know which ones) because it's based on an old version of Basilisk II. Like Basilisk II it does not emulate most of the hardware, but relies on ROM patches. PCE can emulate a Mac 128K/512K/Plus/SE or Mac Classic, but not a Quadra. MESS can also emulate a various models (including Mac IIci and LCIII) but again not the Quadra. Mini vMac emulates a Mac Plus and Mac II. It emulates all hardware except for the floppy drive. 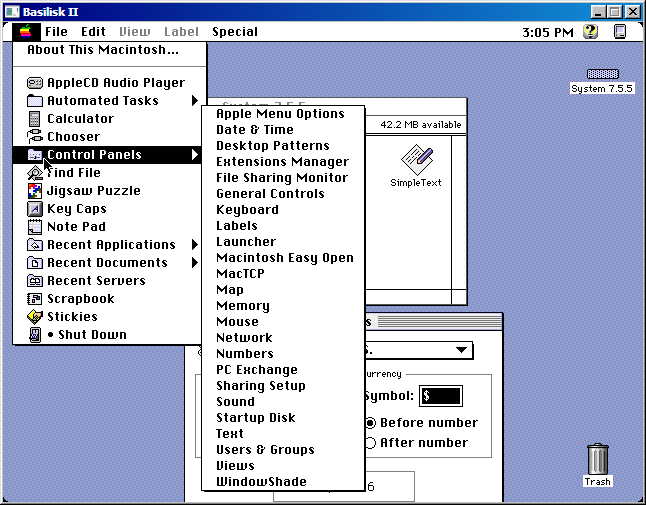 Shoebill emulates enough of a Mac II to run A/UX (it does not run Mac OS). PCE, MESS, and Mini vMac have more faithful emulation than Basilisk or Cockatrice, but they don't emulate later models. Shoebill was specifically made to run A/UX and doesn't run anything else. Not the answer you're looking for? Browse other questions tagged emulation apple-macintosh software-recommendation or ask your own question. What Commodore 64 emulator and assembler to use? Can the Gotek floppy emulator be made to work with classic Macs?